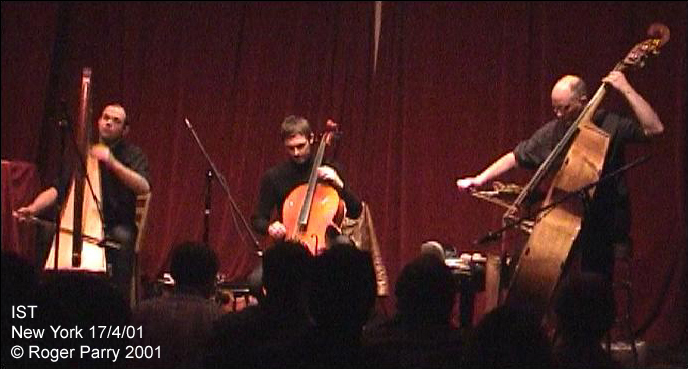 Formed in 1995, IST use acoustic string instruments, including extended techniques and preparations, both to create improvised music and realise experimental composed music. The members are all noteworthy figures in the current London Improvised Music scene, and either individually or together are members of The London Improvisers Orchestra, Evan Parker's String Project, Butch Morris' London Skyscraper, Derek Bailey's Company and Chris Burn's Ensemble. Between them they have performed with many of Europe's key improvising musicians. Trio activities/performances have included a UK Arts Council Tour in 1998, S4C Television, London's Barbican, New York's Tonic, the Total Music Meeting in Berlin, Contemporaneamente 2002 (Italy), London's Freedom of the City Festival and performances in Marseille, New York & London as part of Derek Bailey's Company. Although primarily concerned with creating music through improvisation, IST's repertoire includes several compositions commissioned and/or premiered by the group, including Sowari For Ist (Phil Durrant), Cubism and Icons (Simon Fell), X-ist (Guto Puw) Sweet And Lovely (Philip Clark) and Ritmico (Mark Wastell). The trio has also performed pieces by Carl Bergstrøm-Nielsen, Earle Brown & Karlheinz Stockhausen. Welsh harpist Rhodri Davies first came to the attention of the London improv scene as a member of the Simon Fell Septet, performing at the Unsung Music Festival in 1996, shortly after he had joined the string duo of Fell & Wastell to form IST. Since that time Rhodri's star has risen with breathtaking rapidity, and he has subsequently worked with every key British improviser, in both European and International contexts. His arco and prepared harp techniques are quite literally revolutionary, and are rewriting the history of this instrument. Simon Fell is a composer and double bassist active in free improvisation and contemporary jazz and chamber music. He has worked in small or medium groups with John Butcher, Peter Brötzmann, Lol Coxhill, Billy Jenkins, Joe Morris, Keith Tippett, John Zorn, Derek Bailey, Joey Baron, Elliott Sharp, Billy Bang, Christian Marclay and numerous others, and is a founder member of London Improvisers Orchestra. Other regular groupings include SFQ, Mick Beck's Something Else, Hession/Wilkinson/Fell and many more. He has presented compositions for improvisers at the LMC Festival, the Termite Festival, the Frakture Festival, Leo Records' Unsung Music Festival, Freedom of the City Festival and on many other occasions. His discography includes over 100 recordings. "A major contemporary musician" - The Penguin Guide To Jazz On CD.